How many times have you heard a teacher say that your child has tremendous potential 'if only he'd just apply himself' or 'if only sh'd work just a little harder'? How often have you said the same thing to your son or daughter? Or perhaps you have a coworker who can't seem to finish anything; his reports are never in on time, or her projects are always behind the schedule. No matter what excusses you hear, you suspect that laziness is the real reason for your colleague's low productivity. Almost no one is actually lazy, says Dr. Mel Levine, author of the #1 national bestseller A Mind at a Time. Low productivity -- whether in school or on the job -- is almost always caused by a genuine problem, a neurodevelopmental dysfunction. despite this, untold number of people have been stigmatized by unfair accusations of laziness, many of them adults who still carry emotional scars from their school days. 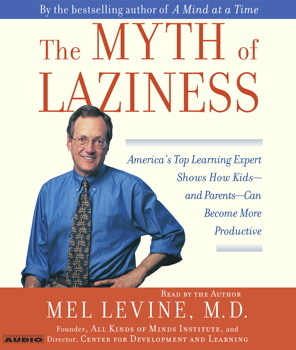 In The Myth of Laziness Dr. Levine shows how we can spot the neurodevelopmental dysfunctions that may cause 'output failure,' as he calls it, whether in school or in the workplace. Dr. Levine identifies seven forms of dysfunctions that obstruct output. Drawning on his years of clinical experience he describes eight people -- children, adolescents, and adults -- he has worked with who exhibited one or another of these problems. He shows how identifying the problem can make all the difference, leading to a course of corrective action rather than to accusations of laziness and moral failure. With its practical advice and its compassionate tone, The Myth of Laziness shows parents how to nurture their child strengths and improve their classroom productivity. Most important, it shows parents how correcting these problems in childhood will help children live a fulfilling and productive adult life. The author made a number of good points in the article, and I found many points in the book relevant to the children that I work with on a daily basis. However, the points were repeated over and over, which made the book very difficult to listen to.